'Taste the Rainbow' is the Skittles strapline, and while you can't eat your receipts there can sure be more rainbow in them. Rainbow receipts for the refrigerator door! Based on the purchases the receipt will either show a 'thank you' or a prompt to purchase Skittles the next time. 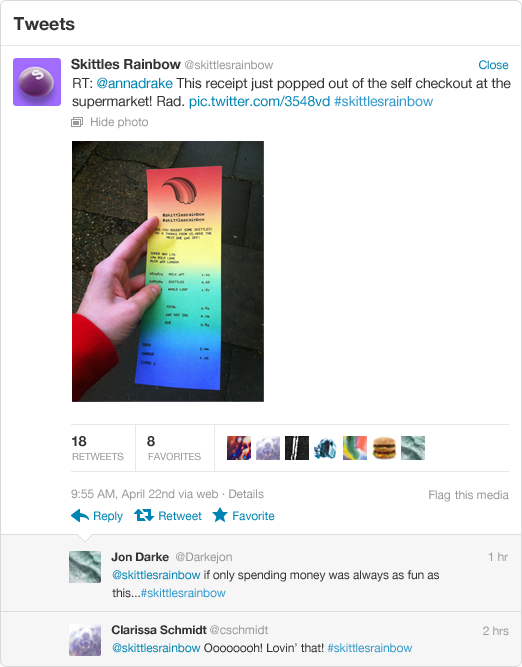 Each receipt is has a discount for a pack of Skittles and prompt to tweet @skittlesrainbow. The hashtags and the twitter account on the receipt prompt the customer to share the receipt on social media, broadening and continuing the conversation with the customer, friends and Skittles. Conversations are trackable via the #skittlesrainbow hashtag or by direct contact to @skittlesrainbow.